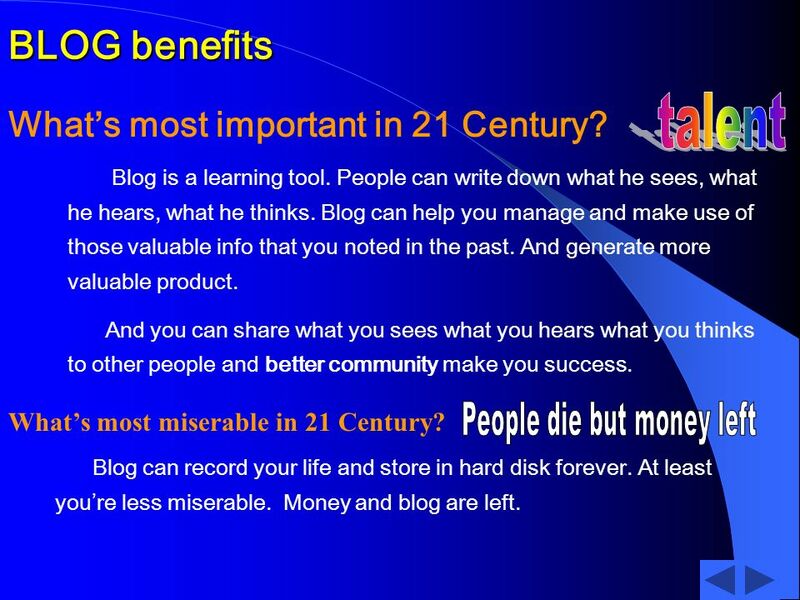 3 Whats most important in 21 Century? Whats most miserable in 21 Century? 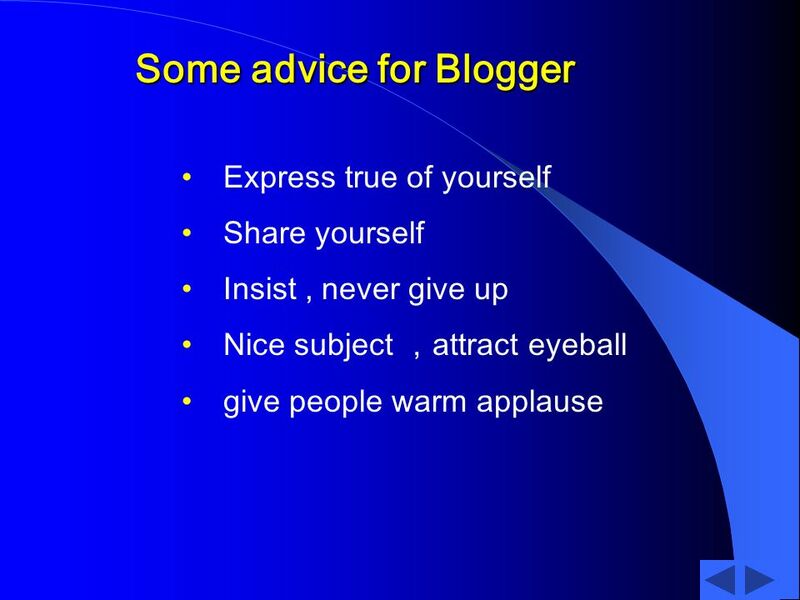 Blog is a learning tool. People can write down what he sees, what he hears, what he thinks. 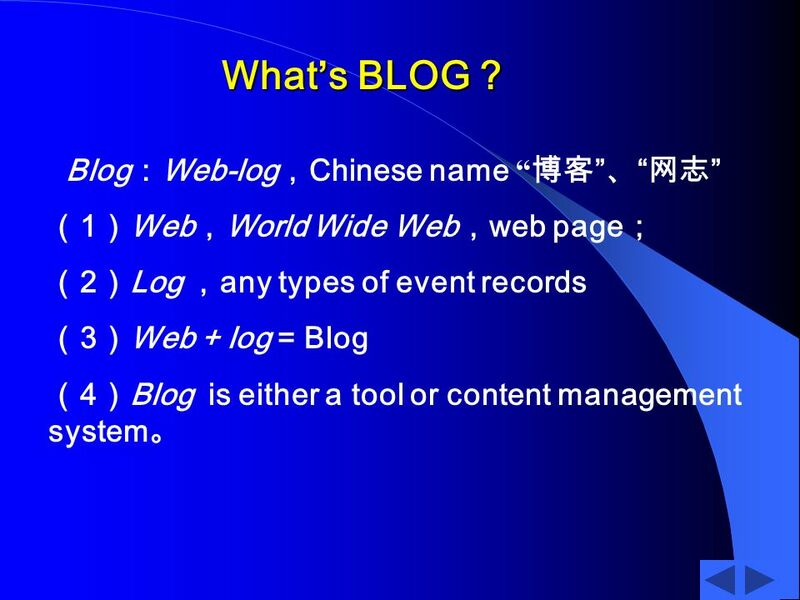 Blog can help you manage and make use of those valuable info that you noted in the past. And generate more valuable product. And you can share what you sees what you hears what you thinks to other people and better community make you success. 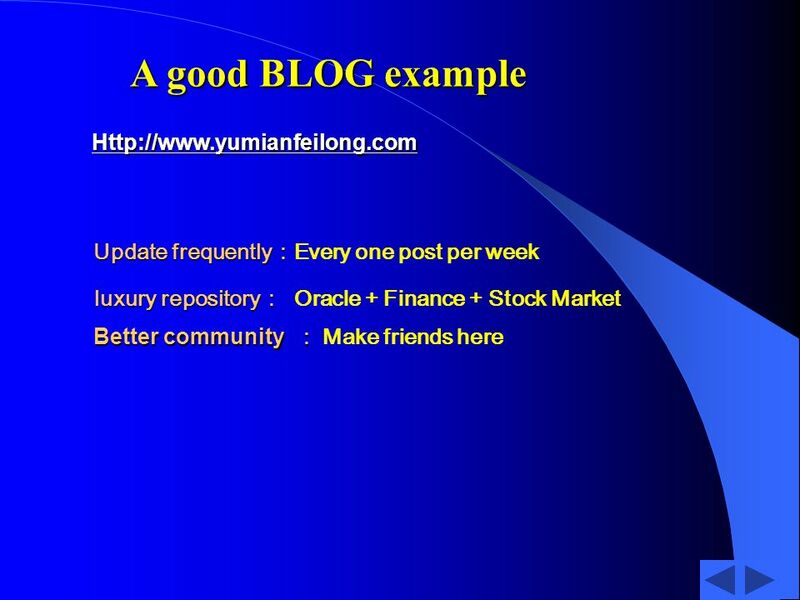 BLOG benefits Blog can record your life and store in hard disk forever. At least youre less miserable. Money and blog are left. 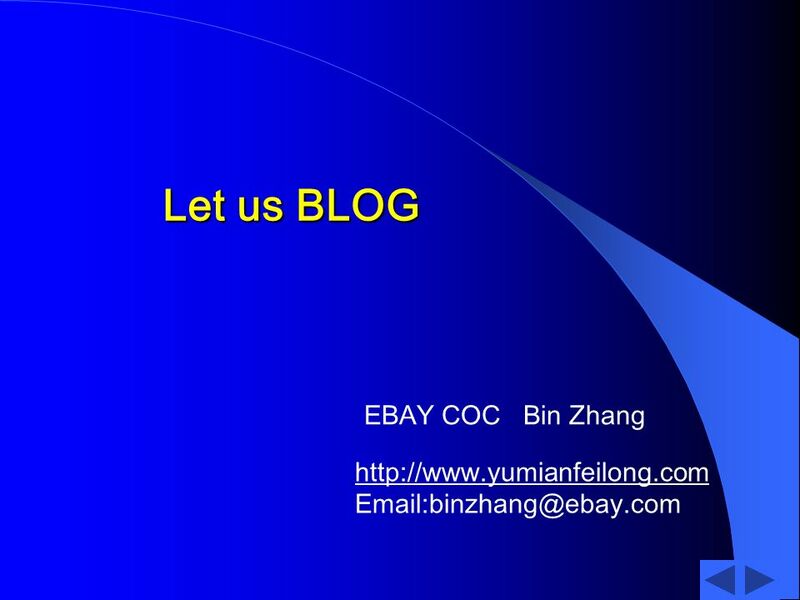 Download ppt "Let us BLOG EBAY COC Bin Zhang"
MyiLibrary ® Library Administration Pre-Login Website Training (New Users) July 22, 2010. MCB/Emerald. Name of service: Emerald License in place: country-wide for all university libraries, not-for-profit research and learning institutes within. Our Social Media Why and how to compose a social media release. = == Lemons & Lemonade TBWS Certified Trainer Class. Private Label Rights Creation To Marketing. Student Homework Assignment Assignment One Ready for the next challenge. Great! Head over to the Warrior Forum. © 2009 Jacob Richman Fascinated with How to use Facebook to promote yourself, your blog, your products and your services by Jacob Richman International. TCL Online Welcome to the TCL Online course demo. This brief tour will give you an overview of our learning platform and a preview of what to expect from. Visit The Worlds First Guaranteed Results Marketing Firm Topic: List Building. Slides will automatically advance Back to Online demo Welcome to the Safety Insite. com. 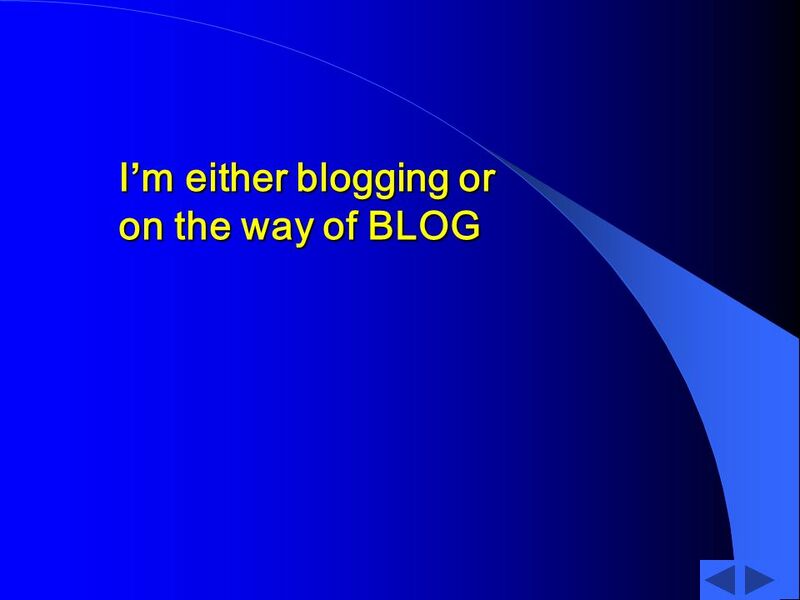 Wikis, and Wikis, and Blogs Oh My’ By Tracy L. Chenoweth. WORDPRESS. WHEN YOU MEAN BUSINESS How and why Wordpress can be the perfect platform for businesses. WAL MART – THE LARGEST RETAIL GLOBAL CHAIN Anthony Cervantes. Web Technologies Using the Internet to publish data and applications. What is Social Networking ? What is Social Networking ?